Interpreting someone’s thoughts can be a difficult task even for the most psychological minds. So the idea of adding color, patterns and charactersitics to this formless ether would be even more of a challenge – unless you are artist Shane Guffogg. The Strathmore native has made an impressive career of abstract paintings that attempt to answer the unanswerable question of what thoughts look like. 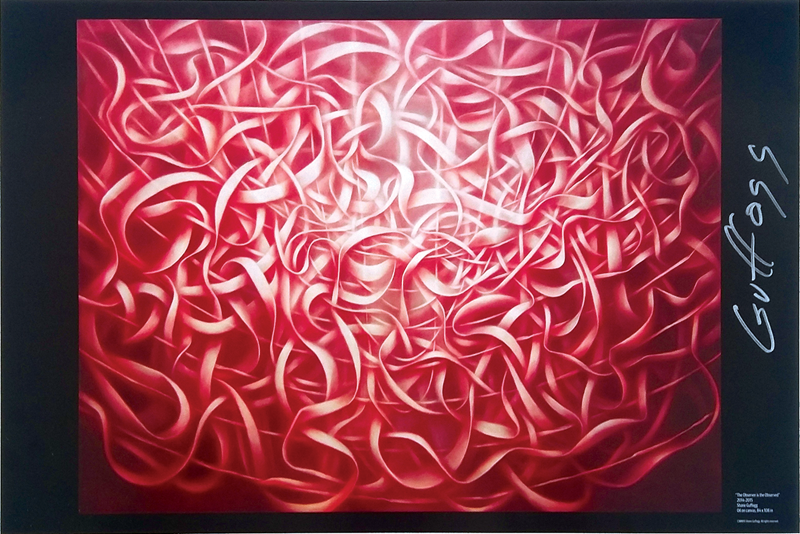 Guffogg is known for his calligraphic oil paintings that seem to literally hover between abstraction and realism. His glazing technique is similar to the Old Masters. Guffogg often spends 3 to 6 months on a painting, applying more than 80 thin, translucent layers that create the illusion of light coming from within the paintings. Guffogg will display over 30 paintings and works on paper, including private sketch books, that span 34 years of his life. Guffogg’s reflections on these works will be printed and on display next to the works of art, giving viewers a chance to see and hear his view of his journey as an internationally acclaimed artist during a reception from 5-8 p.m. on Saturday, Nov. 21. Guffogg’s life-long journey of creative exploration began in Lindsay, where he attended school through 7th grade before his family moved to Strathmore. He attended Sunnyside Elementary before graduating from Strathmore High School. Guffogg’s pictorial journey begins with his return from a summer trip to Europe at 18 where he was inspired from seeing some of the world’s greatest paintings of the old masters. During his time at Porterville College, he began absorbing the ideas of 19th and 20th century art history and questioning what Einstein’s theory of relativity might look like. The exhibit will include pieces from his time at Cal Arts and the work that immediately followed. In 1988 Guffogg returned to his family’s ranch in Strathmore and began painting the familiar images, fruit from their orchard. This return to his roots opened up new ideas of what art could be. Guffogg graduated from Porterville College in 1983, and transferred to California Institute of the Arts, graduating in 1986 with his BFA. Guffogg moved to New York City for an internship with the artist Gary Stephan. Guffogg began exhibiting his art in 1989 at the Wade gallery in Los Angeles and since then has been in over 100 exhibitions around the world. His most recent was in St. Petersburg, Russia at the Imperial Academy of Arts Museum. This exhibition consists of 73 paintings and 3 sculptures that span 27 years. The exhibition is scheduled to travel to the Pushkin Museum in Moscow followed by the Palais de Tokyo Museum in Paris in the summer of 2016. This exhibition at the Lindsay Museum is unique. Guffogg has chosen art that has rarely been seen by the public but documents his thoughts and ideas, starting with his first self-portrait, as the old Dutch Master, Rembrandt, moving to his most recent abstract paintings which he describes as Wordless Poems. “The Art of Shane Guffogg” will run Nov. 21, 2015 through Jan. 10, 2016 at the Lindsay Museum, located at 147 N. Gale Hill Ave. in Lindsay. For more information on the show, contact Virginia Wilson by calling 559-562-2684 or emailing ginny.wilson@gmail.com.